Bonner Kiernan earned eight defense verdicts for The TJX Companies, Inc. in 2011, surpassing the six defense verdicts we earned for them in 2010. 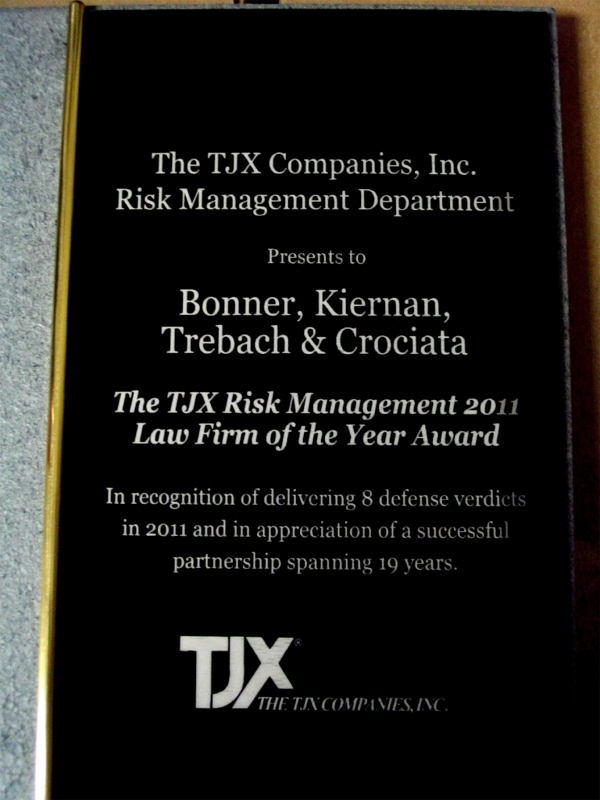 TJX recognized the firm's efforts and success by presenting Bonner Kiernan "The TJX Risk Management 2011 Law Firm of the Year Award" for the second year in a row, and recognizing the nineteen year partnership between Bonner Kiernan and TJX. Our firm is proud both to have represented TJX for nearly two decades, and for the results that we have achieved on their behalf. The strong partnering relationship that we have developed with TJX and with a large number of our clients is a direct result of our commitment to excellence and our willingness to do the work necessary to achieve success.